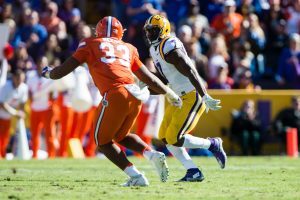 The Florida Gator defense was in shambles the last time they faced the LSU Tigers. The defense is ravaged by injuries and playing many young, inexperienced defenders. No easy task for any player having one of their first starts on the road in Death Valley. Not to mention having the entire country not giving the Gators a chance. The young Gators earned their stripes against the Tigers by slowing down the dominant LSU rushing attack. 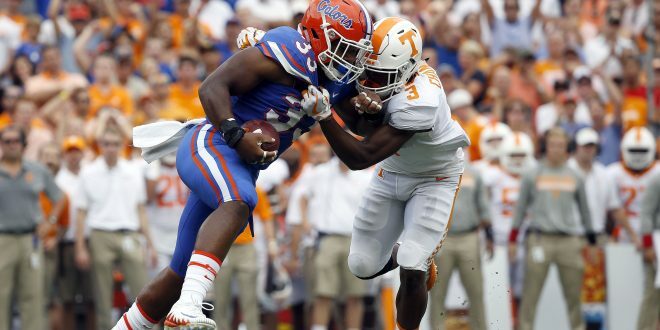 The Gator defense was led by freshman linebacker David Reese. In his first taste of the Florida-LSU rivalry, the Farmington, Michigan native Reese led the team with a career-high 12 tackles. This led to a monumental win for the Gators and a SEC Defensive Player of the Week award for Reese. Now a proven sophomore, Reese hopes for a similar outcome in his second meeting with rival LSU. #Gators LB David Reese: "It meant a lot to win that game (LSU) last year and it's going to mean a lot to win in The Swamp this year." The Gator defense has struggled at some points during the early part of the season. The main cause of concern for Gator fans has been the inability of the defense to tackle runners in open space. This inability almost cost the team in the home opener against Tennessee. The tackling has slowly improved since then, but it is still a point of emphasis on that side of the ball. Reese acknowledges the defense’s need for improvement. An alarming sight for the Gator faithful on Saturday was the ability for Vanderbilt to turn short underneath routes into big gains. However, Reese knows this can easily be corrected. For last few years of Gators football, the defense has carried the team with the offense just along for the ride. Both sides of the ball were rarely helping each other out. This year, that trend has slowly started to change as the season progressed. In the Week 1 loss to Michigan, the Gators only had the ball for 25 minutes. In last weeks win over Vanderbilt, the Gators won the time of possession battle by having the ball for 36 minutes. The longer possessions that the Gator offense has been able to put together the last two weeks have benefited both sides of the ball. Reese strongly believes that this has helped the defense improve. Longer possessions give the offense prime scoring chances while giving the defense necessary rest. This will be key come Saturday’s matchup with LSU. It’s no secret that the contributions the Gators have received from the freshman have exceeded most expectations. On both sides of the ball, the freshman has assumed the spotlight. Offensively, that contributor has been freshman running back Malik Davis. Davis has stepped up big time in the absence of leading rusher Jordan Scarlett. Reese states what makes Davis different from the other backs on the team and what makes him so successful. Reese also had high praise for the young players on his side of the ball. He spoke very highly of the two freshman corners: CJ Henderson and Marco Wilson in their contribution. Reese also made a bold prediction about the two garnering post-season recognition. The 20th ranked Florida Gators host the rival LSU Tigers Saturday. Kick off from Ben Hill Griffin Stadium is set for 3:30 p.m. Coverage on ESPN Gainesville begins at 11:30 a.m.